You might have seen yesterday's Strawberry Lime Agua Fresca recipe. Today, we have Pineapple Lime Agua Fresca. Same idea, totally different flavor. In a lot of drinks, you can get away with using store-bought juice. Not this one. One of the best things about an agua fresca is the fact that it tastes like you just took a bite of fruit. You've got to go fresh on this one. This recipe is adapted from one I found, by Culinary Explorer, on Yummly.com. 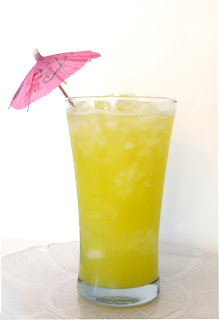 If you're looking for a tropically delicious, refreshing, cooling beverage, look no further! This is the one for you! 1. For the Simple Syrup: combine the sugar and water in a small bowl. Microwave for 20 seconds. Stir until the sugar is dissolved. 2. Puree the pineapple. Strain the juice into a bowl. You should end up with 2-3 cups of juice. 3. Stir together the simple syrup, pineapple juice, and lime juice in a pitcher. Stir in the 2 cups of water. 4. Pour over plenty of ice. Serve!